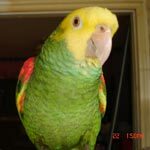 Parrot Forum • View topic - Where do you put your Parrot when it's out of the Cage? Where do you put your Parrot when it's out of the Cage? When I take my Senegal out of the cage, chances are she ends up on my finger, and gradually climbs up my arm to my Shoulder. . . . . I've never been comfortable with having a Parrot on my shoulder. I just don't really like having a Parrot bite my earlobes, or climb up my eyeglasses. No, Thank You! So, even though I have a "Percher" my Senegal will stay on it for about 60-seconds before she attempts to Fly off .....and ends up on the floor. It's a real dilemma. 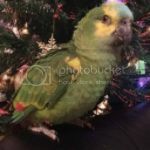 Re: Where do you put your Parrot when it's out of the Cage? Mine spends most of her time on me. She has a playgym she also goes to and on other occasions she will sit on top of the door or her cage top. Patrick, aside from the fact that she is a baby and all babies require close contact regardless of the species, senegals are shoulder birds and not allowing her on your shoulder is not going to work out for her or for you. You say you don't want a bird biting your earlobes but I might as well tell you that the best way to teach her this is to keep her away from you because she will grow up disaffected and, as soon as she reaches her sexual maturity and becomes more self-assured, she will bite you. Patrick I thought you had overcome this fear of a bird on your shoulder? I do my housework with Liseth on my shoulder and it's where she spends 95% of the time. The other time she is playing . When she sits on the door it is in order for her to see me when she isn't allowed in the kitchen because I'm cooking. It really isn't a question of where do you put your bird when out of the cage, because the bird belongs with you and will make that clear to you. alienlady wrote: Patrick I thought you had overcome this fear of a bird on your shoulder? I do my housework with Liseth on my shoulder and it's where she spends 95% of the time. The other time she is playing . When she sits on the door it is in order for her to see me when she isn't allowed in the kitchen because I'm cooking. You have an Amazon Parrot, and I have a Senegal. I, for one, would not want an Amazon on my shoulder. Maybe I'm just crazy, but I really don't like being bit, and for some odd and strange, weird reason, 'JoJo' just likes to bite me when she's on my shoulder. I have no FEAR of a bird on my shoulder, I just prefer not to be bitten. Call me Crazy! Outside of the bird room, I have different bird stands strategically placed around my home for the birds to go on. This both keeps the parrots off of my furniture and keeps poop and mess where I'd expect it. They will spend time on my but they will also go back to their perches to poop, rest, or play. Since they are made of the same kind of NU Perch as the parrots have in their cages, they all recognize them immediately. It's a complete system of perches for parrots to both enjoy, be comfortable on, and stay on instead of going on people stuff. I started out just making this stuff for myself but because it drew a lot of interest, I've made it available for sale on ParrotWizard.com. Patrick I obviously misread the situation, I do apologise. The first word anything learns to under stand is "no", I say it calmly so as not to upset the bird but they learn the word no right away. Of course your bird can say it too.